A white button down blouse and Mykita giles sunglasses is a smart combo to add to your casual repertoire. When it comes to footwear, this look is finished off nicely with tan leopard slip-on sneakers. If you're obsessed with relaxed dressing when it comes to your personal style, you'll love this extra cute combination of a blue short sleeve blouse and Mykita giles sunglasses. Wearing a pair of tan suede lace-up ankle boots is an easy way to add extra flair to your getup. If you're obsessed with relaxed dressing when it comes to fashion, you'll love this super cute combination of a tan leather biker jacket and Mykita giles sunglasses. You could perhaps get a little creative when it comes to footwear and spruce up your ensemble with black and white horizontal striped leather pumps. Opt for a grey sweater dress and Mykita giles sunglasses, if you want to dress for comfort without looking like a hobo. When it comes to footwear, this ensemble is finished off nicely with white slip-on sneakers. If you're all about comfort dressing when it comes to your personal style, you'll love this super cute pairing of a white knit crew-neck t-shirt and black sunglasses. A pair of grey espadrilles will add some real flair to this ensemble. If you're all about relaxed dressing when it comes to fashion, you'll love this extra adorable combination of a black blazer and Mykita giles sunglasses. Take a classic approach with the footwear and throw in a pair of tan suede knee high boots. We all seek comfort when it comes to dressing up, and this combination of a dark green camouflage military jacket and black sunglasses is a vivid example of that. If you're obsessed with relaxed dressing when it comes to your personal style, you'll love this super cute pairing of a burgundy leather biker jacket and Mykita giles sunglasses. Black suede gladiator sandals work spectacularly well within this ensemble. Reach for a black double breasted blazer and Mykita giles sunglasses, if you want to dress for comfort without looking like a hobo. 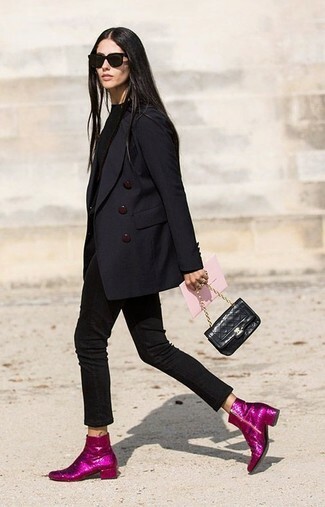 Bring instant interest and excitement to your outfit with hot pink sequin ankle boots.